I’ve been having fun drawing birds all week, in preparation for (the reprise of) Draw A Bird Day this Friday, the eighth. I found the photograph for this image at my friend Jodi’s blog at Life in Between. This mama cardinal’s eggs are due to hatch pretty soon(! ), so now is a good time to follow the action over at Jodi’s place. She takes amazing photographs of fun, food, and the wildlife she encounters in rural Pennsylvania, and her posts are always a joy to read. She’s also a very kind person who’s a joy to know. Since I’m focusing this week on bird art, I’d also like to share a link to the blog of an artist friend, Jill at Jill’s Art Journal. Jill is so full of joy, and her artwork is, too. A bird appears on her blog every day, and it never gets boring because Jill can do anything: paintings, drawings, collages, even quilts! There is no limit to the mediums Jill explores, and she even writes stories about the birds she invents from her imagination. They are usually carefree and zany, like Jill herself, and her blog is a fun place to hang out. Jodi and Jill never fail to encourage me with their uplifting comments, and no matter what kind of day I’m having, it’s bound to get better after an encounter with either of them. I’ve been very fortunate to find lots of kindred spirits here at WordPress, but these ladies share a particular interest in birds, and so I wanted to give them a plug on this fine Wednesday morning. They have both created some pretty amazing bird artwork recently, and you’re sure to find something to inspire you at their sites. Jill recently encouraged me to start an art journal, and I’m so glad she did. What better way to gauge your progress than to create a little something every day in the same little book. I did a little research, and came across this journal at Amazon, and since I was placing an order there anyway, I added it on. For just about $7, you can’t beat it for an 84-page book. The paper is nice and thick, 100 lb. smooth paper with just a little bit of tooth to grab the pigment off my colored pencils and watercolor pencils, while being smooth enough for ink and pencil drawings. The reviews said that it could take a light watercolor wash, and they were right. I’m not sure I would do a full-on watercolor painting in this (I’ll try it at some point and report back), but I drew this bird in her cute little nest with Derwent standard watercolor pencils, and used a #10 round Royal synthetic watercolor brush with just a bit of water to go back and liquify it. At first, the back of the page was a little puckery (just a bit), but once it dried, it’s virtually flat on the back. How cool is that? Plus, it’s spiral-bound and lays flat! I was really happy with it, and I can recommend this for light mixed-media work, including collages as well, because of the thickness of the paper. Thanks again, Jill, I hope I’m up to the challenge. I’d love to look back at this (hopefully full) book three months from now, and who knows, maybe my drawings will improve some between now and then. Well, we’ve made it to the hump! I want to thank all of you for reading and commenting. I learn so much from all of you, and I’m so grateful for the journey I’m on at this point. I hope we’re all warming up for the dance, as it’s only two days away! 😀 Peace, love and lots of fun feathered friends to you all. < Easy Does It. And, Why Patient is Better. Oh Laura! How sweet is this?!! The drawing first of all! You rocked it! And the sweet post and kind words… You brought such a big smile to my face this early morning. Here’s the funny thing. I’ve been thinking about draw a bird Friday, and I awoke early thinking about it this morning. 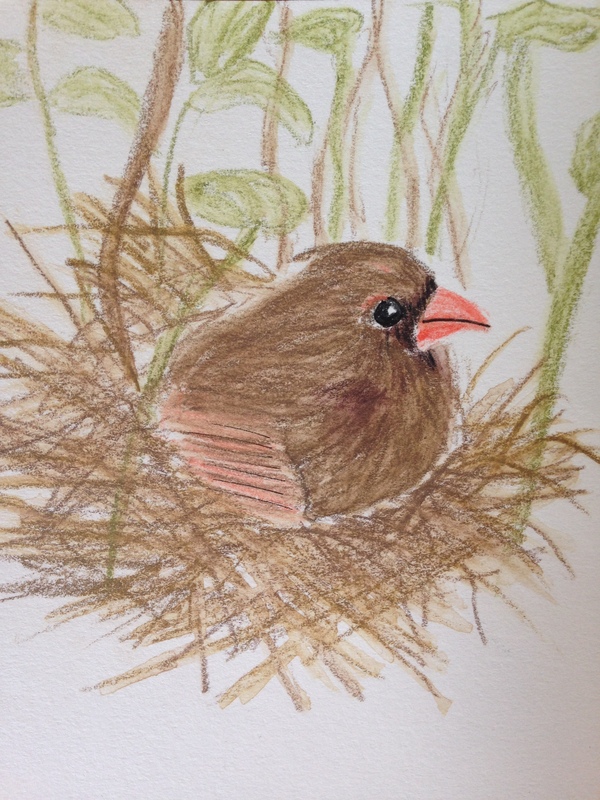 I thought – what if I could draw Mamma cardinal in her nest, so I brought the photo up on my screen, and I just got overwhelmed looking at it and trying to think how to draw it. Decided I couldn’t do that one. Then I thought of your lesson yesterday, and drew the basic bird shape, oval body, head, tail, beak. But it’s just a generic bird – rough sketch. I am stumped thinking about adding detail.. Now I’m thinking something whimsy and abstract and silly. But nevertheless sitting her before the sun is up with windows wide open and the birds are singing a symphony outside while I poke around and contemplate. I’m keeping close vigil as it’s been about a week and a half now that she’s been sitting on those eggs. Fingers crossed for some cute little cardinal babies soon! He he!! That really is cool that you were thinking about drawing the same photo! I have to say, I found it very challenging because so much of her is hidden, and then the nest and foliage was hard for me because I don’t really draw either. But bird feet IMO are hard, so in that respect, this one was easier (but only in that respect)! Your whimsical bird was adorable and if I could do those, I’d be happy, but if you really wanna draw a bird for the first time, it might be easier to draw one on a branch. So cute. We have cardinals, but I hear them more often than I see them, especially now that the leaves are covering the trees. What fun to watch one nesting! She is soooo cute in the actual photo, and Jodi even has a video of her at her site. The eggs should be hatching any day, and her view of the nest is perfect! I hear them all the time too, but like you, I hardly ever see them! I found this quite challenging to draw. Your Mets were tough last night!! I thought the pitching and fielding was outstanding!! You must be pretty excited about the season! Bartolo to the rescue again. He really is something. I’m still reserving judgment, considering their play for the last week. I hope they keep on (well, not tonight, but for the rest of the season lol) going and surprise the whole country. I love to see the “underdogs” do well. They’re sure not playing like underdogs! Yes, a Mets-O’s World Series would be fun. Thanks so much for that kind compliment, Jill! Yes, you really CAN do all that! I’m very glad to have found you both as well, and really, the whole community here is very cool. It gives me that feeling of being part of the artist co-op at the beach (which really would be my dream job, lol)! Amen! I wish I could escape from my business. It’s been an exhausting day. Numbers and art don’t mix (unfortunately). Your work inspires me and I’m glad you share your “escapes” with us! Such a sweet post! Love the birdie and really enjoyed getting this amazon recommendation – sounds really good! I think I´ll order it. Thanks for sharing!! !